Saint Rose has an archives? Yes, we do! My name is Maria McShane and I am the College’s archivist. If you haven’t visited the Archives, we (myself and usually an intern) are located on the 3rd floor of the Neil Hellman Library. By the way, if you’re wondering: “archives” is the noun, “archive” is the verb. The mission of the Saint Rose Archives is to collect, describe, preserve, and make available materials by and about persons affiliated with the College which have legal, administrative, or historical value. Basically, the mission of any archives is to save something of value and make it available to anyone who is interested. From its inception in 1920, people have been collecting documents, objects, and memorabilia about the College. Many of these materials have survived and are now located in the Archives. In addition to official records of the College, there are photographs, scrapbooks, objects (like the Rose Queen crown), oral histories, videos, yearbooks, course catalogs, student newspapers, and rare books. 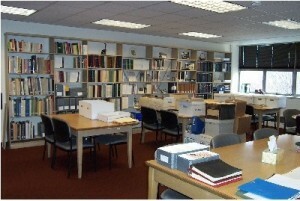 Everyone, within or outside the College, is welcome to do research in the Archives. The Archives is open by appointment Monday through Friday. We work with individuals and host classes. If you’re a faculty member and would like to create a project using archival materials, just let me know. Yes! We have digitized a large volume of items already and we’re adding more every day. 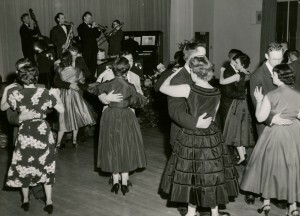 Check out the main page of the Archives Digital Collections to access photographs, yearbooks, student newspapers, oral histories, campus maps, student publications, videos, books, and more. Our archives is also part of New York Heritage – a website that combines collections from archives, libraries, and historical societies across the whole state. My contact information is on the Saint Rose Archives web site. Feel free to send in your archives question and maybe it will be the next Tale from the Archives. I look forward to following your blog, Maria! 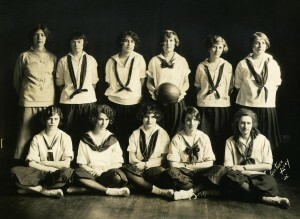 I didn’t realize I could browse Saint Rose image archives online- thanks! Thank you for posting this Maria. It reminded me to check the online archives and found 2 stories I wrote for the Chronicle way back in the day. I’d totally forgotten about them. Thanks for the trip down memory lane.